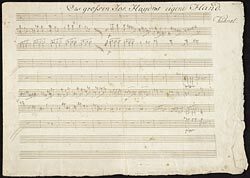 Haydn, Joseph, 1732-1809. Trios, piano, strings, H. XV, 30, E♭ major. Presto. Selections . Piano trio in E♭ major, H. XV, 30, end of the Presto : autograph manuscript, 1796?